The Fall semester for BAC officially started this past Friday, August 22, 2014 with the CityLab Intensive, a highly focused and fast paced, hit the ground running type of mini boot camp that emphasizes critical and creative thinking skills through an exploratory process of sketching, writing, mapping and diagramming the world, in our case, Boston’s Rose Kennedy Green Way and Chinatown. I am not very familiar with Boston. I have been to Boston many times, but mostly it’s been at night and for music. Afterwards I leave the city and therefore I have never felt that I have gained a true sense of Boston. The Boston I discovered Friday and Saturday was a very alive, active, accessible and friendly city and this was the first time that I had been to Faneuil Hall, The Rose Kennedy Greenway and to Chinatown. We started our explorations at Faneuil Hall Marketplace. It was very crowded and at once you could tell it was more of a tourist destination, peppered with street performers, shopping and food, of course, it’s a market. I did not leave S. Market Street, which is a patchwork of older and newer brick, granite slabs and blocks. I started a few sketches and felt that I was not capturing the variety of surfaces and textures of this street so I switched to taking pictures. After Faneuil Hall, we gathered across the Greenway at the Harbor Pavilion where Shaun O’Rourke, lead us to 4 sites along the Rose Kennedy Greenway. Our first site was in a large open field in the Greenway. I remember it being very loud and we had a strong onshore wind and many people were in the park. Tall narrow screens stood at the edge of the field which provided slivers of shade across the grass which I could imagine people picking up blankets and baskets, moving feet at a time, following the shade across the field throughout the hours of the day. We all spread out and found our spots to sit and sketch. Along with our sketches, we were asked to think of words that describe how we were experiencing the site. After 10 or 15 minutes we regrouped and followed Shaun across the street towards the waterfront and walked south a bit to a small park. It was an island surrounded by a street on all four sides. The ground was made of granite pavers, uneven and it all sloped downwards back towards the Greenway. Across the street opposite the Greenway was the harbor and the wind blew hard through this place. It was shaded by many low canopy trees which made it cool and comfortable. There was a wild little garden area in raised beds the whole place felt easy. We listened, contemplated and sketched and before anytime seemed to pass we it was time to move on. We then continued south to an area of the Greenway where there is a tunnel entrance for traffic merging onto northbound I-93 and sketched an imaginary section cutting across the Greenway through the tunnel entrance below us. The last area we stopped was the ending of our day. 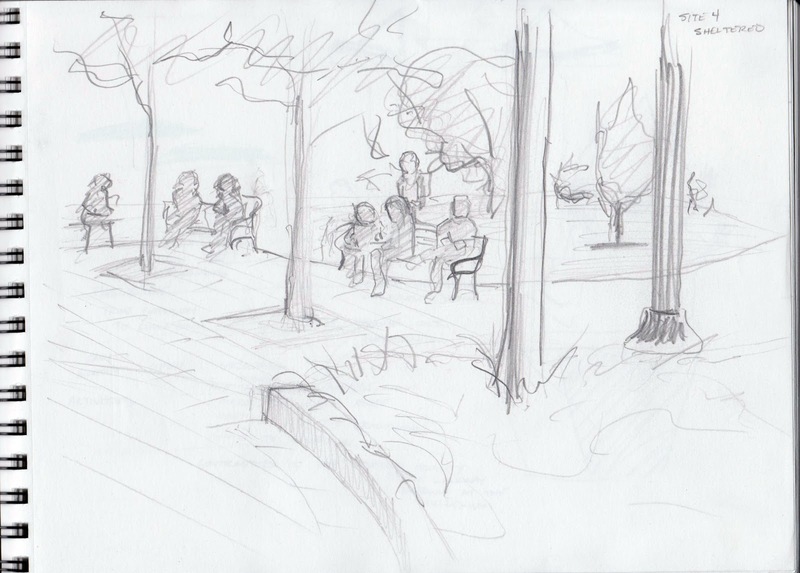 We sketched some more and then each group gave presentation of their collective reflections of the site. It was a place where the pathway opened up from a lush garden walkway to a circle of benches under a ring of trees. Across the little road that cut the Greenway were the food trucks and umbrella shaded tables. The next morning we gathered at the Boston Society of Architects for lectures about the history and operation of the Rose Kennedy Greenway and the history of Boston’s Chinatown. After lectures we walked south a few blocks to Chinatown, located at the southernmost point of the Rose Kennedy Greenway. There are so many little surprises in Chinatown. I had never heard of a Chinese Masonic Lodge and artistically colored telephone booths dotted the blocks. After the morning lecture about the history of Chinatown, I came into the neighborhood with a deep sympathy and a little sadness. Sabino and I interviewed a Vietnamese store owner who predicted there would be no more Chinatown in 10 years. I almost believe her but I don’t want to. We found a great view of the skyline, sitting on the steps to a restaurant looking across a half empty parking lot at a row of Victorian buildings, each personalized by the generations of tenants that have occupied them and some still do I’m sure. Hovering above is a high rise under construction complete with crane. To the right, a new high rise apartment, to the left, the Tufts Medical Center buildings. I found CityLab to be a great experience. I had never participated in a design exercise of this scope and I left each day with my head buzzing full of ideas, question and new possibilities. Everyone I engaged with was very enthusiastic, supportive and encouraging. The BAC leadership was outstanding, caring and supportive. I am really looking forward to next weekend’s CityLab and the rest of the semester. To see photos from the first weekend of the F14 CityLab Intensive, click here.